Ciaran O’Sullivan cannot continue in the role with the county due to work commitments. Ciaran O'Sullivan on the sideline for Cork during the 2018 league campaign. CIARAN O’SULLIVAN WILL not be part of Ronan McCarthy’s management ticket in 2019 after announcing his decision to step down from his role as selector. 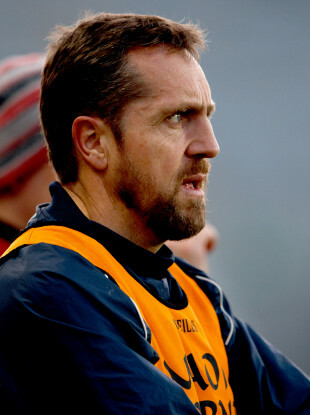 O’Sullivan enjoyed a lengthy playing career with the Rebels and played in the 1993 and 1999 All-Ireland senior finals, while he also served as selector under Brian Cuthbert in 2014 and 2015. And McCarthy brought O’Sullivan back on board for his first campaign in charge last year. The five-time Munster medalist said work commitments were the reason for his departure. “I would like to thank Ronan McCarthy for the opportunity and I would like to wish the players and management all the best for the year ahead,” O’Sullivan said in a statement on the Cork GAA website. Rebels boss McCarthy and county chairperson Travey Kennedy paid tribute to O’Sullivan. “I would like to thank Ciaran sincerely for his immense contribution to Cork football as a player and in more recent years as a selector,” said McCarthy. “Ciaran has always demonstrated an enormous passion for Cork football, illustrated in the huge personal sacrifice he has made to his family and business commitments. Kennedy added: “On behalf of Cork GAA I would like like to thank Ciaran for the service he has given as a Cork football selector. Cork open their 2019 campaign tomorrow afternoon where they face Limerick in the McGrath Cup semi-final. Email “Former Cork football star announces decision to step down as selector”. Feedback on “Former Cork football star announces decision to step down as selector”.